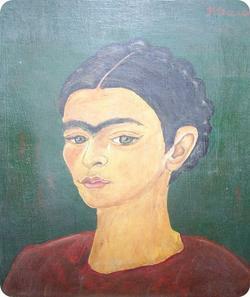 New Frida Kahlo painting found!!! As far as I know, the last Frida Kahlo oil that sold at auction sold for 5.6 million dollars. However, apparently you can buy this one without a provenance on Ebay for an estimated $9,500.00. It's Ebay item number 190078828890, and as of the posting of this post, someone is bidding for this "vintage" Frida painting circa 1930. (Update: It sold for $5,700). 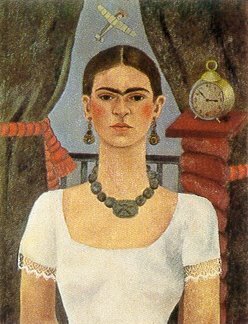 Personally, I didn't know that Frida had green eyes, and apparently neither did the person who painted this portrait and certainly Frida herself. And oh yeah, under her "signature" the words "Mexico" have also been "signed in." Just in case, I guess. Below is "another" portrait that Kahlo painted in 1929-1930... you make the decision that this is a work by the same artist at this same period. Sigh... And oh yeah... here are some of the other art finds that this "dealer" is offering; none of them has a provenance, of course! Knowledge is the best weapon. PS - Here's another newly discovered "Kahlo painting." Tomorrow night one of the most anticipated events in the world of comicbookdom will take place: The midnight release of Stephen King's Dark Tower: The Gunslinger Born #1 comic book. I recommend the purchase of a dozen or so of them, then wrap them in plastic and stash them away and forget about them. Nearly 150 retailers across the country will open at midnight on Tuesday (effectively 12:01 a.m. Wednesday, February 7, 2007) so that geeks who can't wait Stephen King fans can get their hands on the debut issue of the comic. Oh yeah, had you picked up the Dark Tower series back when they were first published in book form in the 80s, you'd be sitting on around $20,000 worth of books right now. And look in your attic, a first edition of The Stand goes as high as $25,000 and Carrie and The Shining routinely break $5,000 each. Around the Greater DC area you can pick them up at Big Planet Comics located at 4908 Fairmont Avenue, in Bethesda, MD, tel: 301-654-6856. Other nationwide locations here. One of the few good things about moving is when you find things that you had forgotten that you had stashed away. And a nice surprise was the re-discovery of this small (7 inches x 5.5 inches) portrait of one of my professors. 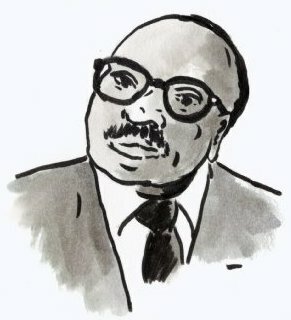 It's a portrait that I created back when I was a student at the University of Washington School of Art. He is/was of one of the most influential and courageous American artists who's never been given a show at the National Gallery of Art (although the Phillips Collection did step up to the challenge of a major Washington, DC area art museum actually focusing on a great artist who just also happened to be an African-American, and put up a great exhibition). Georgetown's Department of Art Music & Theater and Gallery 101 are located off the main campus in the Walsh Building (at 1221 36th St. N.W. in Wash. D.C.) They are a small (approx. 400sq Ft. or the same size as my first gallery) space off the main lobby of Walsh and the gallery shows 4-5 exhibits in all media per academic year. Information on current and upcoming shows can be found at this website. From that site you can find a link at the top to the gallery's page or just go directly to it here.